Adjusting bifold door height is accomplished by using the second adjustment feature of the bottom pivot pin. Two reasons that I can think of that would require you to adjust the height of the door. Not sure if this is your problem? See the articles 'Troubleshooting Bifold Doors' and 'Solving Closet Door Problems' for a listing of all of the closet door topics. (1) You have a four panel dour and the margins are all parallel, but the two sets of panels don't line up. You can adjust the height until they do. (2) The rollers are popping out of the track when you use the door. Raise the door until the rollers stay in place. 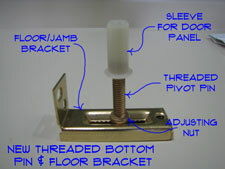 The bottom pin can adjust the height due to the fact that it is threaded. Just get a wrench and turn it turn clockwise to lower the door and counterclockwise to raise it. The design of the floor bracket should allow it to turn in place without disturbing the other alignment you may have done. Every thing working? Good job, you have been successful at adjusting bifold door height on your door. Adjusting bifold doors is part of the installation. There is a clip in the track that the top pivot fits into. This clip has a set screw that holds it in place. Assuming that the opening is square and plumb you want the margins around the door to be even. You loosen the set screw and move the door closer to the frame or father away. Is the door binding on the frame when you try and open it? It is too close to the frame and needs to be moved away. Is the door binding against the other door or the far side of the frame? In that case you want to move the pin closer to the frame. The safest thing to do is take the door out when you adjust the clip. Lift the door up and tilt the bottom out of the opening. The problem with this is that you have to keep putting the door in and out to check the adjustments. With the door open you can hold onto the door (better yet, have someone else hold it), and loosen the set screw with the door in place. Adjust as needed and tighten the screw. Depending on where the door is binding, you may have to also adjust the bottom pin. The idea is to have the door far enough away from the frame so that it opens without friction. The door should not be so far away that it binds with the other door or the far side of the frame. A quarter of an inch of gap is about right, although it could be wider. A properly aligned door should have a consistent margin along the top, sides and if it is a four panel door, down the center. For a four panel door the tops of the two doors should be even with each other and the center gap should be even. It takes a little practice to get the sense of how the movement of the pins affects the overall alignment of the door. Be patient, once you get the idea you'll always have that understanding. The bottom pivot pin works similarly to the top one. The difference is that this pin is set in a toothed clip. 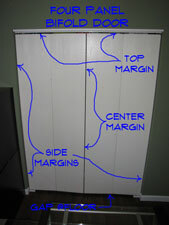 To adjust the margin on the door you pick the door up and move it toward or farther away from the frame. The same adjustment principles apply with both pivot pins. Remember also, that moving the pin in or out also affects the top margin. I know, sometimes it can be aggravating. Use a pry bar to lift the door and try to move it one notch at a time until you get it right. The notch system is a little less sensitive than sliding the top clip. You may need to make a minor adjustment on the top, once you have the bottom pin the way you like it. Okay, I know, you're probably wondering why I didn't tell you to work on the bottom pin first. If it is clear that you will have to move both pins, then this is a good idea. Unfortunately, it is usually not that clear and sometimes you go back and forth between the two of them, or four if it is a four panel door. Right, wrong or indifferent, I always start with the top pin. So that's how I wrote the article. Keep making adjustments until everything lines up and the doors operate freely. Adjusting bifold doors takes time, but it is worth effort to have a door that operates smoothly. Adjusting a bifold door involves some trial and error. However, after a few minutes, you should be able to get the door working again. If you have not done so already, you want to lubricate the hardware to keep things running smoothly. See the article, 'Lubricating Bifold Doors' for instructions. Is the door too far gone or damaged? You may need to consider replacing it. See the article 'Replacing a Bifold Door' for more information.